Spike Lee sported a stunning shoe during the playoffs of last NBA season and this shoe is set to be released by Jordan Brand anytime. 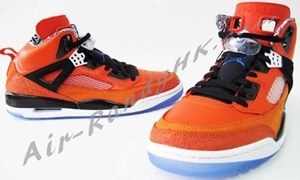 Known as the Jordan Spizike “Knicks”, this model is said to be one the verge of being released soon in an orange colourway, patterned with the New York Knicks team colors. The orange color dominates the upper part of the shoe that sits on a blue translucent outsole! There is no definite release date but we’ll definitely keep you updated!